Saint Patrick’s Day is just around the corner and NC AOH divisions will be holding events throughout the entire month promoting Irish American Heritage. Keep an eye on the NC AOH Facebook page this month for frequent posts featuring various Irish Americans. To pay for a spot on an existing team or purchase a sponsorship package proceed directly to step two below. If you have any issues or questions please email wakeaoh@gmail.com. Any Hole-in-One made by the challenge player wins $5,000 for the player and $5,000 for the Wake AOH. The player who hits the “Fourth Best Shot” in each group wins a Sleeve of Golf Balls. If every player in a Group enters the Challenge, the team goes to the Green and short Putt for a birdie. At the end of the outing one player will get a shot at Hole in One to win $50,000 (plus an additional $50,000 to the AOH). The player will shoot from 165 yards out on the 9th or 18th Green. Player ($100): includes one entry into the golf tournament, goodie bag, beer on the course, and a catered luncheon. Gold Sponsorship ($500): includes tee box signage, goodie bag, full-page program ad, the opportunity to speak about business for two minutes at catered luncheon, free spot in tournament foursome, and 10 door-prize raffle tickets. Silver Sponsorship ($250): includes tee box signage, goodie bag, 1/2–page program ad, the opportunity to speak about business for two minutes at catered luncheon, and 5 door-prize raffle tickets. Bronze Sponsorship ($100): includes tee box signage, goodie bag, and 2 door-prize raffle tickets. 1) Register a team in step one below. Submit it prior to paying. Send additional players to wakeaoh@gmail.com when they are known. 2) Pay using the cart in step two – include your Team Captain’s name. Step One – Register a team, submitting it before paying in step two. Step Two – Pay for players, purchase a sponsorship package, or donate to the AOH. 1) When paying for players be sure to include the team captain name if known. 2) Gold sponsors packages include one free player. The Wake County Ancient Order of Hibernians hosts an annual St. Patrick’s Day Dinner Dance open to all those interested in celebrating the holiday. Join us for a fun evening of food, drinks, dancing, and raffles! Dancers from Triggle Academy of Irish Dance will perform prior to dinner and a DJ will provide the dance music after the meal. During the evening the winning ticket for the Hibernian Charity of Wake County Vacation for Four to Ireland raffle will be drawn. The winner receives airfare, 7 days and 6 nights at a Bed and Breakfast, and a rental car. There are no blackout dates – just use it within a year of winning or choose $5,000.00 instead. Tickets are $100 each with only 150 sold. Raffle proceeds go to charities, churches, schools & scholarships that the AOH (wakeaoh.com) supports locally in Wake County as well as in Ireland. Dinner tickets are $35 per person in advance and include a buffet dinner of corn beef and cabbage, shepard’s pie, salad, soda bread, tea, coffee, dessert as well as beer and wine. Tickets increase to $45 after March 1st. Dancers from Tríonóide Academy of Irish Dance will perform prior to dinner and a DJ will provide the dance music after the meal. Dinner tickets are $35 per person and includes a buffet dinner of corn beef and cabbage, shepard’s pie, salad, soda bread, tea, coffee, dessert as well as beer and wine. This richly costumed show marries ancient, traditional Irish entertainment with exhilarating contemporary stage technology. Rhythm of the Dance is a breathtaking and spectacular musical production that is a true celebration of Ireland presented through song, dance, and storytelling. We have also arranged bus transportation to and from the show for only $15. The bus will leave from Pat Murnane’s Irish Pub in Wake Forest at approximately 6pm. Seating is limited so reserve your seat on the bus now! TICKET SALES ENDED February 23rd. 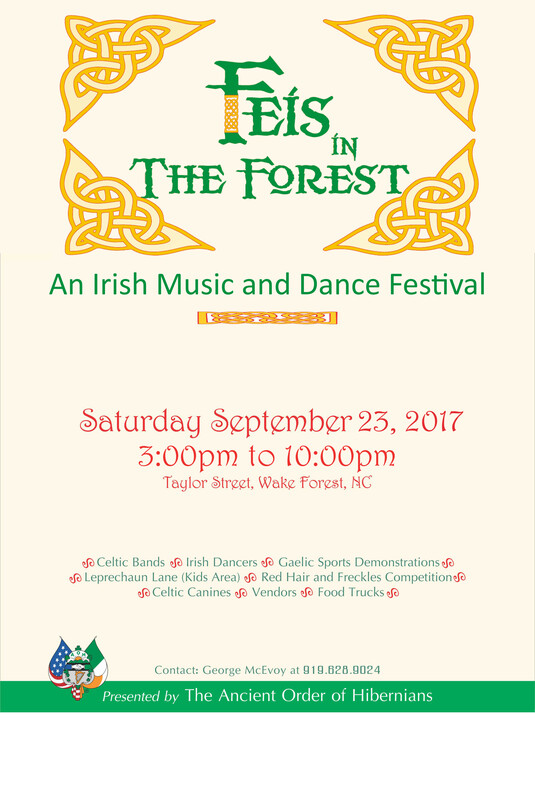 The 2017 Irish Music Festival will be September 23rd on South Taylor Street in downtown Wake Forest from 3pm-10pm. If you would like to become a sponsor for this year’s festival, visit our sponsors page.